This was my supper yesterday. It got unbelievably chilly last night after the typhoon passed. After spending some time in the heavy rain in the late afternoon, I felt very cold and tired when I got home. Maybe catching a cold? 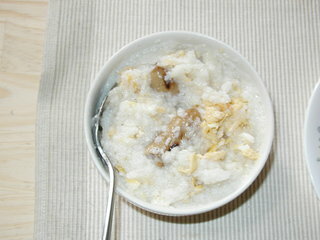 So I decided to make the rice porridge that I usually eat when I have a cold. 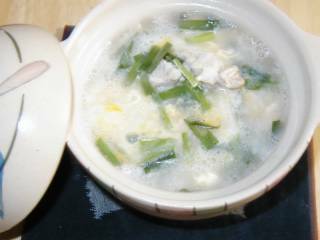 To this special porridge, I put chicken, egg, and a lot of Chinese chive. For seasoning, I used instant dashi stock and soy sauce. This small earthen pot or donabe is my favorite one. It’s a special donabe for porridge-making (for one serving). See? The top can be used as a rice bowl. One question: Are Chinese chive and leek the same thing? Typhoon Meari is coming. It’s just landed on Kyushu, and is coming this way. I’ve just evacuated my herb planters to the bathroom and spilled some dirty water from the planters on the kitchen floor. Nice way to start a day, ha! On a day like this, the humidity is almost intolerable. The air conditioner helps, but still, having to stay in the room with storm shutter closed is not so much fun, especially when you had to experience it too often in about one month. Anyone would want something refreshing, and it’s better to prepare it while the power is still on and the ice cubes in the freezer aren’t melt yet. This is “sudachi” drink. I put some grated ginger, honey, sudachi juice in sweetened soda. Yes, this sudachi is the leftover from the yuzu chicken night. This wasn't a great success, because the strong sweetness of the soda killed the ginger and sudachi flavor almost completely. I should've used unsweetened soda. 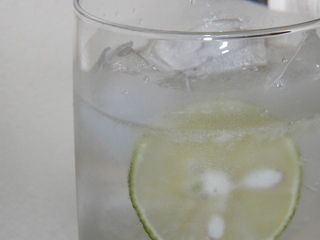 But still, the look of this drink and the sound that the ice cubes made in the glass did make me feel refreshed. 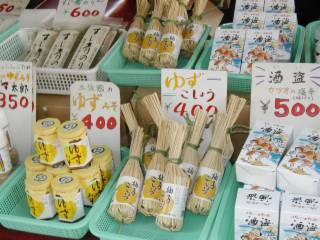 One of my photos of the Sunday Market shows some “Yuzu Kosho,” but I had never tried it before. Actually I didn’t know we had such a thing here in this town. Yes, yuzu is popular here… we have lots and lots of yuzu-related stuff sold in this prefecture, thanks to the locally famous Umaji-mura (Umaji village)where they grow tons of yuzu. People in my hometown, including my family, HAVE TO add some yuzu-vinegar in addition to the regular vinegar when making sushi, and in addition to ponzu sauce when eating Nabe. But many people here don’t even know what yuzu kosho is, and I, too, didn’t know until very recently (2 days ago) that it was a paste of ao-togarashi (green chili pepper?) mixed with grated yuzu rind. OK. Time to try something new. So I made this … which I have no idea what to call. 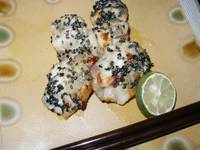 Yuzu-kosho sesame chicken? Anyway, I seasoned the chicken pieces with sake, mirin (rice wine) and just a little bit of salt. Then I put just a little of yuzu kosho on the chicken surface (because it was so spicy when I tasted it beforehand)and sprinkled the black sesame seeds. The chicken pieces were placed in a baking dish, covered with aluminum foil, and baked in my toaster oven. I don’t use toaster oven for baking cakes and cookies, but for this kind of cooking, toaster oven is faster. When it looked almost done, I removed the aluminum foil and heated some more until the chicken turned golden brown (or something close). And ……… IT WAS GREAT!!! 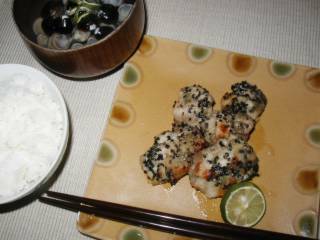 With the squeeze of sudachi (a kind of citrus), the combination of spicy yuzu kosho and sweet sesame seeds added a great flavor to the chicken. Oh this is going to be my must-have when I drink warm sake in winter! OK, I got tired of working on the computer almost non-stop all day like yesterday and the day before. I needed to do something to brighten up and get stimulated in a totally different way. I know what. Trying a new recipe usually works well in this kind of situation. What I like about making this kind of curry is the process of mincing garlic. What I don’t like is mincing onions (and you know why). Anyway, I basically followed JMom’s recipe but used less oyster sauce and a little more coconut milk. I also added a little chicken stock (frozen) because I needed to make some empty space in my freezer. Then, like she did, I used the basil from my balcony garden. 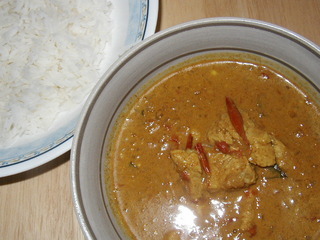 Actually, my curry didn’t have as much meat and vegetable as JMom’s , but it tasted just fine. For lunch today, I heated up the frozen “banana rice” (leftover from the other day) and had it with the curried pork. It was not bad, except that I didn’t smell banana at all this time. Maybe frozen food cannot keep its original scent very well? 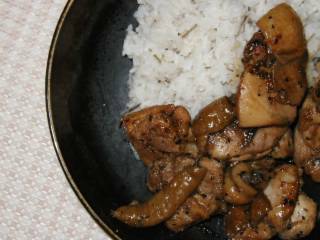 For supper, I had the curried pork again with some long-grain rice as in the photo above. This was even better! It wasn’t too spicy to my tongue, but my whole body felt very warm after meal. It was definitely a stimulating experience! P.S. For supper, I had a bowl of green salad, too. I'm going to be rather busy until next Tuesday, so I wanted to post this before I forget and they grow too big. Now in my kitchen, I have some sweet potatoes from my parents’ vegetable garden. And this is what I made today. So what are they? Good question. When I tried to put caption for this photo, my fingers just froze on the keyboard. What is this dessert called in English? OK. We call it “suiito poteto” which is “sweet potato” pronounced in a Japanese way. But when you say “sweet potato” in English, it means the potato itself, not a dessert, right? Then what should be the name of the dessert I made? This is how I made it--- I microwaved the sweet potatoes, mashed and pureed them, then beat in sugar, egg yolk, heavy cream and cinnamon, and, using a pastry bag, piped the mixture into paper baking cups. After glazing the top with egg yolk, I baked them in the oven for about 25 minutes. 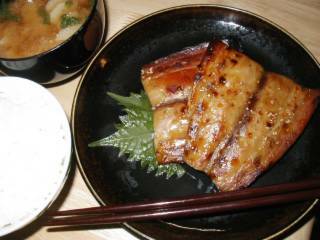 This “suiito poteto” is very popular in Japan and most of the recipes are very much alike. Yeah, simple and yummy. Everyone’s favorite. 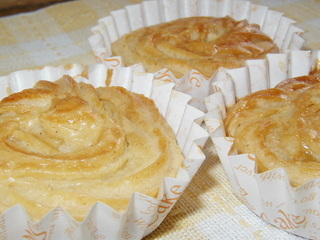 * I used this recipe (in Japanese) today. 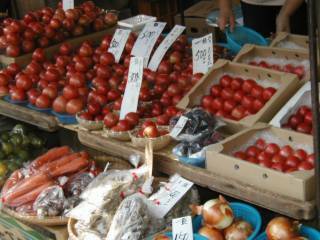 On my way back from my parents’ house to my apartment yesterday, I visited the Sunday Market. 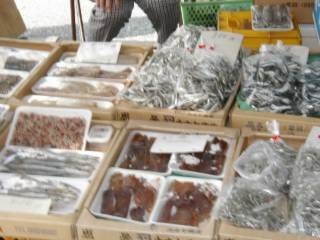 This is a very famous market (at least in this prefecture) which has a long history of 300 years. 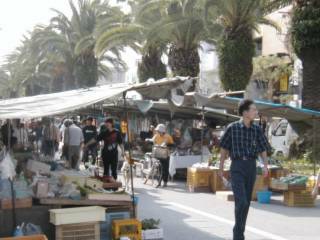 About 600 outdoor stalls open along the 1km(apx.) street near the castle. How about that? 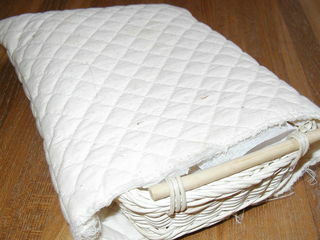 You can find almost anything here: foods, everyday items, antiques, plants, and accessories.... I even saw live goldfish today. I’m the kind of person who has to buy, once in a while, fruits and vegetables that don’t have barcode labels on. 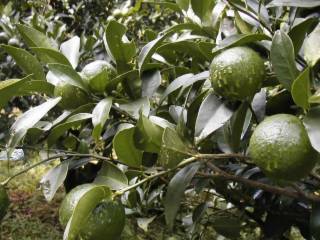 *yuzu: a kind of citrus fruit. I visited my parents’ house over the weekend and spent some time with my mom in the vegetable garden and my father’s orchard. My parents grow vegetables in the garden right behind their house, and several kinds of citrus fruits in the orchard which is a bit far. Well, I guess I could describe my family as basically easygoing, or carefree (or careless). Here’s an example. My mom had told me several times this summer that birds were eating almost all figs on the fig tree. 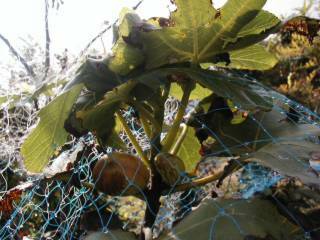 Then she said she put a net over the fig tree to protect figs from the birds. Yeah, I see the net. Mom, if I were a bird, I wouldn’t give up eating the figs on this tree. Most of summer vegetables (tomatoes, okuras, eggplants, bitter gourds, cucumbers, etc.) were already gone and instead, I saw sprouts of spinach, Japanese horseradish (Daikon) and some other vegetables. This was the only one that had something ready to pick. Later, mom wanted to pick some lemons, so we went to the orchard. It’s about 10 minutes’ walk from my parents’ house, UPHILL. The oranges look like this now. Ponkan oranges: a very popular kind in my hometown. There are too many mosquitoes in the orchard. Long sleeve shirts are the must-have. Oh, you want to know what I ate at my parents' house? Sliced raw bonito. Fresh from the ocean. Believe me, it tastes very good when it's fresh --- so good that I forgot to take a photo of it. My first attempt this year to grow dill from seeds was not successful. 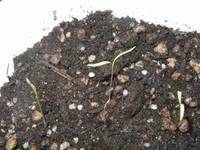 I planted the seeds too late and it got too hot while the young dill plants were still very small and weak. So all of them died in mid August. 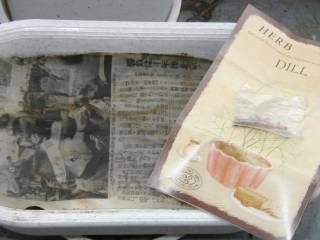 Now that the hottest time of the year seems to be over, I decided to give it a try again.It is often said here that covering the planter with newspaper keeps the seeds moist. OK, I put a small piece of newspaper like this. Hope this works. It’d be really exciting to make a nice fish dinner using dill from my balcony garden, because it’s hard to find fresh dill at stores around here. It wasn’t my idea. Someone I know (a cook) gave me this idea of cooking rice with banana! Last night at work, he told us about the “banana rice” they make at another restaurant he works at in the daytime. At first no one believed it. I know there are such sweets as banana-rice pudding or banana-rice custard, but just simply boiling rice and mashed banana together sounded terrible to me. But he didn’t look like joking. He said that they add, to rice and water, a little mashed banana and herb such as rosemary (salt optional), and cook in an electric rice cooker. When the rice is done, mix in butter while still hot and add other herbs, if preferred. He said they serve the banana rice with spicy ethnic dishes. At that point I was almost bursting with curiosity, and determined to try it out myself at home. I spent the rest of the night thinking about what spicy food would go with the sweet banana rice, and finally picked spicy lemon-chicken. Today, for lunch, I cooked the “banana rice” as the way he told me. (He didn’t tell me the amount of ingredients in detail, so I just followed my hunch.) After I put everything in the electric rice cooker and switched it on, I prepared lemon sauce and marinated chicken pieces in it. I was too lazy to do an internet search for lemon chicken recipes, so I just mixed things that seemed appropriate: salad oil, lemon juice, garlic powder, oregano, thyme, soy sauce, salt and Lawry’s Seasoned Pepper, again just following my hunch. Then I baked the chicken in the oven. It was an interesting experience. My kitchen was filled with the smell of lemon and thyme from the chicken in the oven, and banana and rosemary from the rice cooker. This was an enjoyable experience I’ve never had before. The result: The spicy lemon chicken really brought out the subtle sweetness of the banana, and rosemary somewhat brought everything together. The harmony was interesting and I liked it… only while everything was HOT. Then, as the food cooled down……I became more and more unhappy. And I still have some banana rice left!! I’m going to have to look for some good n spicy stir-fry recipe that would go with that sweet rice. Just for your information: The dried fish I had today was a sweeter kind called “Mirin-boshi,” which uses more mirin (rice wine) for seasoning than salt. This is how they make this sweeter-kind of dried fish. BTW, can you help me with English? Do you call this “grilled fish” or “broiled fish”??? I heated the dried fish in something like a "toaster oven broiler”. So then it’s broiled fish? Right? 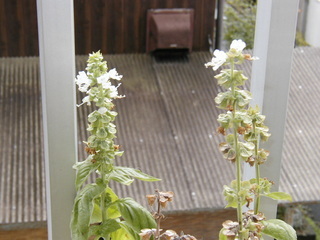 Actually, the basil was already blooming at the end of August, so now you can see some brown parts with seeds inside. I’m surprised to see the mint flowers. The mint leaves were turning brown in mid August, so I didn’t think they’d survive. But they did and now they’re blooming. Wonderful! Now I’m especially happy with this green perilla. If you look close, you can see that this one has some kind of disease. Any idea what it is? To be honest, this was another blooper of mine. 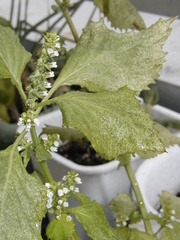 In mid July 2004, I found some bugs eating my young green perilla plants. 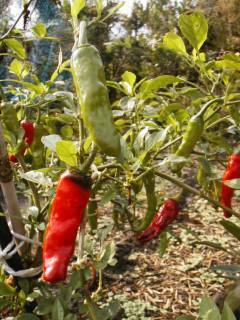 I wanted to avoid insecticide as much as possible, and also I was too lazy to go to the store to buy one. So I searched on the internet to find a “home-remedy” kind of solution. In some Japanese homepages, I read that you could spray milk on plant louses to kill them. I liked the idea and I sprayed A LOT of milk, even though I was sure that the insects eating my green perillas weren’t plant louses. What could kill the plant louses could kill whatever the insects as well, I thought. 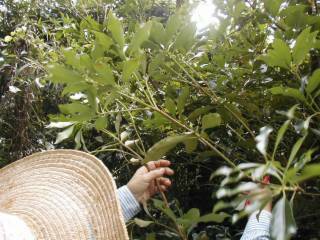 Under the hot summer sun, the milk dried fast and completely coated the leaves. Maybe the coating made the effect of the heat and humidity even worse. Their leaves started looking like this in the photo, and I saw some brown stripes in the stem. Then the leaves turned brown, and eventually all my green perillas died. Some days later, I bought a cheap nursery plant of green perilla and planted it in the same soil as an experiment. If the new one had the same disease, I would have to throw away the soil, too, I thought. 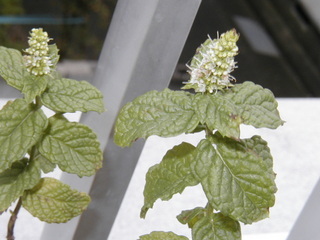 The plant grew perfectly OK up to some point, then again the symptom came, as you see in the photo, but this time without the brown stripes in the stem. They survived somehow, and finally they started blooming!! I heard that you can make tasty tempura* with the flower buds of green perilla. They say it’s a delicacy and privilege of those who grow the plant at home, because the flower buds of green perilla are not available in stores. I might give it a try soon, since I don’t think I want to eat the leaves of my green perilla. *Tempura: Japanese-style batter-fried food (fish, meat, vegetables ... or even ice cream!). The batter for tempura shouldn't be too thick. I just wanted to see how it’d look if I put jello in this bowl. 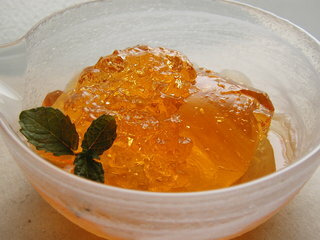 When I saw this glass bowl at a 100-yen shop (something like the 1 dollar store in US), I visualized this nice refreshing image of orange colored jello in the half-transparent, lovely glass bowl. I just HAD TO actually try and see how it’d look. 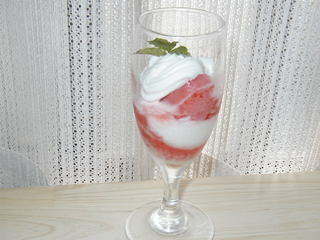 Oh, what the heck, it’s only 105 yen for the bowl (with tax) and I have some leftover jello mix at home! Now this is what I have. What do you think? This was supposed to be a buttermilk biscuit. 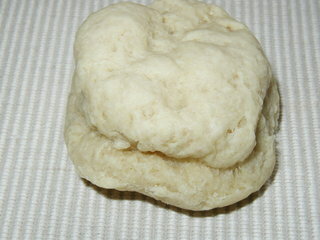 Instead, it turned out to be a piece of baked dough --- disgustingly heavy one. Buttermilk biscuit is my favorite “Southern breakfast food” and I once spent a lot of time searching for a good recipe. I had been pretty happy with a recipe of “buttermilk biscuit mix” which you can store in the freezer for up to 3 months. The trouble began when I read about the problem of “trans fat” and started thinking about replacing the vegetable shortening with other kinds of oil. Once I tried canola oil, and it accidentally worked OK. I should’ve written down how much oil I put at that time, but I forgot, so I still haven’t come up with the best recipe that doesn’t call for vegetable shortening. Today I guess I put too much or too little of something, because I was so absent minded. Just like many other Japanese people, I LOVE RICE. Just like many other Japanese people, I feel very attached to rice and have a special feeling towards it. When I was a kid, my grandma did not get mad at me when I couldn’t finish the meat/vegetable on my dish, but she never let me leave the table with any rice left in my bowl. She strictly made me finish the rice, literally all --- without leaving any single grain in the bowl. According to her, there were gods (or spirits of nature) living in rice, so we should never throw them away. She said, “If you throw away rice, you’ll get punished and be blinded.” I wondered why the spirits were only living in rice and not in other foods, but I couldn’t ask her. Anyway, that kind of childhood experience sort of molded my view on rice, and I had eaten rice only in conventional ways until I went to the U.S. (Of course I didn't believe that eating it in an untraditional way would make the Gods angry. It was more like --- to me, rice was just something different from other grains and beans.) After my stay there, I got very flexible about how I eat rice. I even tried chocolate rice pudding and I liked it. But still, I didn’t care for the idea of using the sticky short-grain rice in salad very much. This time it sounded OK to me, because with the barley mixed, the rice wasn’t as sticky as regular cooked rice. So I gave it a try, and I loved it!! Now this is one of my favorites. 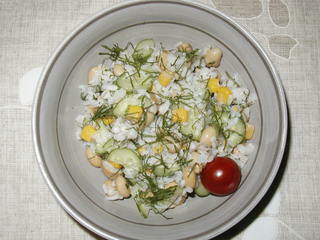 Corns and soy beans are the key ingredients here; they HAVE TO be in my rice salad. These give some sweetness that goes very well with the sour dressing of olive oil and vinegar. And most important: the finely cut green perilla leaves on top. The flavor from this herb makes the salad something really special! I'm sure of one thing, though. My grandma would've never ever approved of this. Did ya’ll have this problem? I couldn’t post anything to my blog all day yesterday. Hope this doesn’t happen too often, or I will have more and more stress-induced wrinkles. 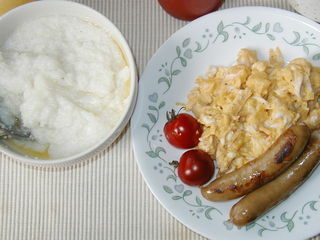 Grits, sausage and scrambled eggs. When I was in the U.S., I stayed in the South most of the time, and this is one of the things I miss the most: Grits for breakfast. It’s sooooooooooo hard to find instant grits here in Japan, let me tell ya. Almost no import food shops have this on their shelves. I know one online shop that has instant grits in their catalogue, but you have to make a bulk order. What I have now at hand was given to me as a souvenir. when you eat your grits. What a pity! Anyway, I do admire the professionals who take food photos for books and magazines. How can they get those photos of breakfast in beautiful sunshine with steam coming from warm food? Of course they have better cameras...but there must be things I can do with my new (used) digital camera to improve my photos. I’ll work on that. Well, I did it!!! 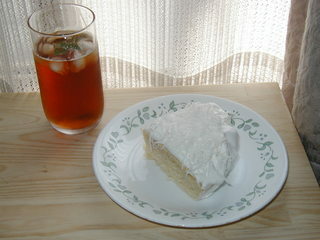 Here’s the coconut cake I made today, skipping lunch! The cake tasted OK, but it did not turn out as light as I wanted it to be. The biggest problem, though, was taking its photos. I never expected this before, but it was actually harder than I thought to find any photogenic place in my apartment that had enough light. Looks like I need to work on using different functions on this digital camera so that I can take better pictures of foods. Even with these areas that need improvement, I’m pretty satisfied with my first attempt to post food photos from this digital camera. I still had some whipping cream left in the bowl, so I made another dessert later using the cream with leftover strawberry sorbet from last night.